Although we can’t always make it home to our families, there is always something happening in the fraternity! 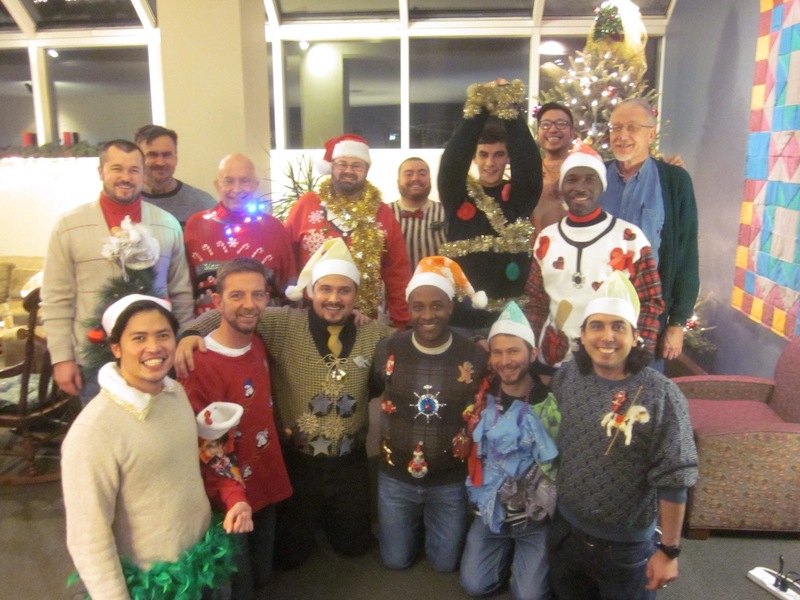 Here is our Christmas tree/ugly sweater decorating party two weeks ago. Being a friar is in some ways like being a waiter at a restaurant: we’re busiest in the evenings, on weekends, and during the holidays, those times when everyone else is off and with family. For most friars, it is often difficult, if not impossible, to celebrate major holidays with our families, at least on the actual date. While this is a common and understandable question for sure, it doesn’t really make sense from our perspective. I’ll put it another way. Let’s say I was married with three kids and I got a week off from my job for Christmas. “I don’t have any occupational responsibilities all week. Why do I have to stay around the house? Couldn’t I take off as soon as work is over, leave my family behind, and go to visit my friends or parents by myself?” Maybe… But its just a bit odd, isn’t it? Just because someone doesn’t have work doesn’t mean they’re free to leave their family. Such is the case with our life. While not blood related, we friars are more than a group of bachelors who live together, we are a fraternity, men who care for and are responsible for each other as brothers. To leave every weekend or to celebrate major holidays with others just wouldn’t seem fitting. This is my family and I want to be with them. So how did we celebrate this Christmas together? Christmas Eve began the festivities with a major break in the schedule. With less than ten guys around (due to the parish obligations of our priests), we ordered pizza and ate in the living room rather than sitting down for a formal dinner. It was casual and spontaneous, and a great time to just relax with the guys. About an hour after dinner, the night got even more interesting. Instead of the usual Evening prayer from the breviary, one of the student friars organized a wonderful “lessons and carols” evening prayer. Gathering in the softly lit chapel, we alternated between Christmas hymns and scripture readings, offering a prayer before moving to the next carol. As Buddy, my favorite Elf, is known to say, “The best way to spread Christmas cheer is singing loud for all to hear.” That was certainly the case for me. Singing Christmas carols and coming together in prayer really got me into a prayerful spirit and ready to welcome our Lord. This is page one of the twelve page music program. It’s quite a parish to say the least! From there, the friars were ready for midnight mass. That is, we were all ready for 10:30 mass. And let me say: Wow. Some will remember my experience at Easter vigil last year (The Joy of Salvation); this was just like that (except without 30 baptisms and lasting almost three hours.) Spanish, Swahili, French, Bangla, English and Latin. And that was just the first song! Include the Kyrie and we sung in Greek as well. Diverse cultures, languages, liturgical customs, musical styles all in one. Even in English, there were traditional songs, gospel spirituals, and new medleys (at least to me) to keep the congregation alive and engaged. There was a homily in Spanish, English and French, and the mass parts included parts from each language group After communion, the choir absolutely brought down the house. 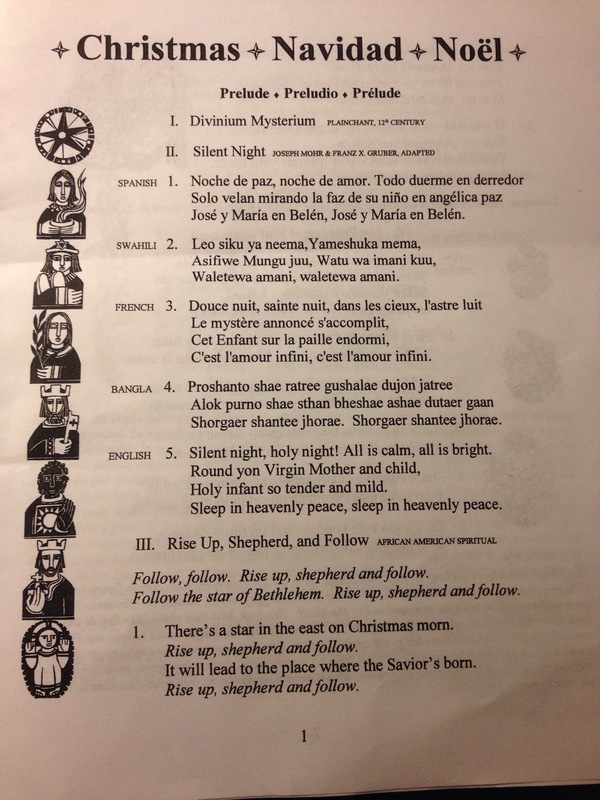 Think about the most powerful rendition of “O Holy Night” you’ve ever heard, change it to French, and add a talented choir and an “on fire” congregation, and you have a communion hymn that almost moved everyone to tears. And I don’t speak a word of French. When you get a group of people together that understand what’s going on–the infinite, invisible God has entered the world in a physical way in order to be with and know us–it doesn’t matter what language you’re speaking or whose customs you’re following: it’s going to move you. I left full of life, inspired by the coming of our Lord, and ready to bring that love to the whole world. 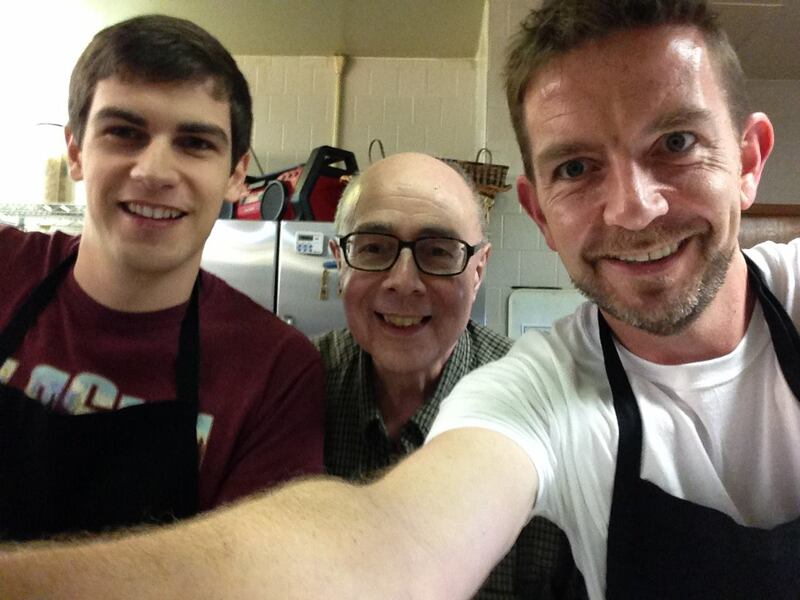 John, Tony, and I hard at work in the kitchen! With most of our solemnly professed friars busy with ministry today, our Christmas began very casually: we prayed at 9:00am and were free to spend the day as we chose. Some decorated the dining room, some did some last minute gift wrapping and some of us, the lucky ones, slaved in the kitchen all day. It was fantastic. The two of us began preparing the food around 11 o’clock this morning (although I think he started by baking a cake at 10:00), and worked non-stop until our 4:30 dinner. First there were the appetizers: pigs in a blanket, mini quiches, and spinach croissants (all frozen), crab and shrimp meat, cheese platters, and hummus with pita chips. (Seriously, those were just the appetizers. Does it make it better that we had 18 people for dinner?) Then came the main course: stuffed pork loin, homemade pasta sauce with rigatoni, green beans tossed with almonds and caramelized onions, caprese salad and some homemade bread. But wait! For dessert there was an incredible chocolate cake with peppermint icing and gingerbread cookies, just in case dinner wasn’t enough. Combined with wine and a room full of great people, the dinner was a huge success and lasted more than an hour and a half. All in all, my Christmas with the brothers was fantastic. Although I didn’t get a chance to be with my family over the past few days, I did get to video message them twice and check in, and now that Christmas is over ,I’ll see them in person tomorrow as the student friars are free to leave on vacation. Free until January 4, I’ll spend a few days with my parents in North Carolina, followed by a few more days visiting friends and friars in South Carolina, before returning to D.C. for a workshop with the other students. I pray that each of you had a wonderful Christmas, and now that we have celebrated the coming our of Lord, may he live through you in all that you do! Peace and all good! Great post. Loved the “Yankee Swap” of gifts which we do each year, as well. I remember my grandmothers sisters who were Sisters of St. Joseph from Brentwood (3of them) who would visit us on the day after Thanksgiving, Christmas and New Years. Because of them, we got to celebrate the holidays a few more days. I know your family will do the same.